I got the BEST surprise last week – FedEx drops off this wonderful parcel at my door! 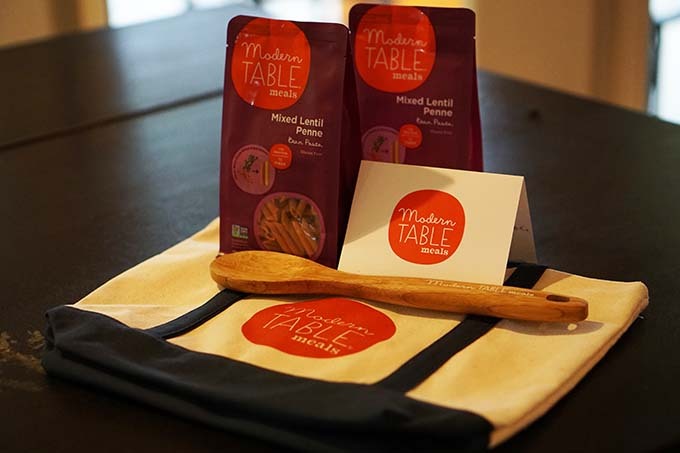 I received two packages of Mixed Lentil Penne Pasta from Modern Table Meals, a super cool bag that will be perfect to use at the grocery store and an awesome mixing spoon! Yay, lucky me!! Now it was time to read up a bit about the product and learn what makes it special! What I found out mix lentel pasta is dairy free, gluten free and vegetarian (I know several of my friends that will appreciate this!) and after cooking with it, I can tell you it’s also quite delicious also! While the veggies are roasting you’ll put a pot of water onto boil and begin working on the brown butter sauce. Don’t let the name scare you – it’s super easy – all you do is put the butter in a small sauce pan over medium to medium/low heat. The butter will begin to melt – you’ll see the solids come to the top and you just skim those off – continue cooking the butter and it will turn a dark brown and get the richest nutty flavor! Next zest a lemon & you’ll need just about 1/3 to 1/2 cup of grated Myzithra Cheese – when the pasta is cooked to al dente drain, reserving about a cup of pasta water. Then it’s time to assemble the dish. In a large bowl, add the pasta, roasted vegetables, brown butter, cheese, lemon zest & the juice of half a lemon. Seasoning with a bit of salt & pepper and that’s it! Perfect pasta – so light, but super flavorful too. If you use the Mixed Lentil Pasta from Modern Table, you can taste the lentils in the pasta and it’s just delicious! 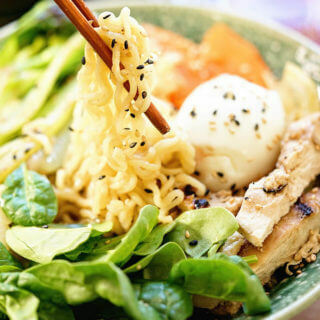 It is a very simple meal, but great flavor – we loved the hint of lemon and all the fresh vegetables, it’s super savory but the lemon definitely balances it out – you’re going to love it too! Not familiar with Myrzithra Cheese? You’ll find it in the specialty cheese section in the grocery store near the grated parmesan, in fact it’s similar to parmesan, but is made with sheep or goat’s milk – quite delicious, a bit less salty. Light lemony pasta and perfect for Meatless Monday or any day! 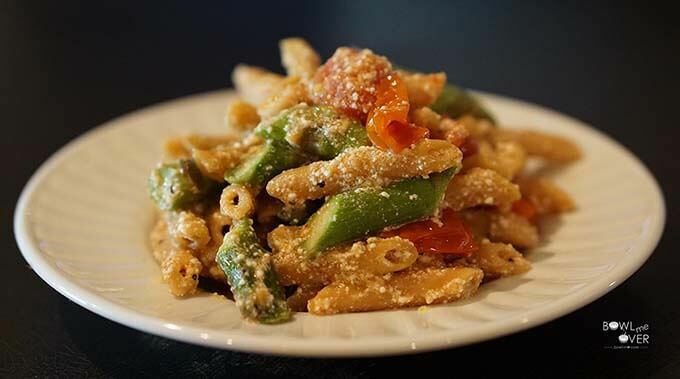 Bright fresh springtime vegetables highlight the flavor of this perfect pasta! Clean asparagus, snap off ends and cut into 1" pieces (I cut them on the bias). Clean tomatoes. 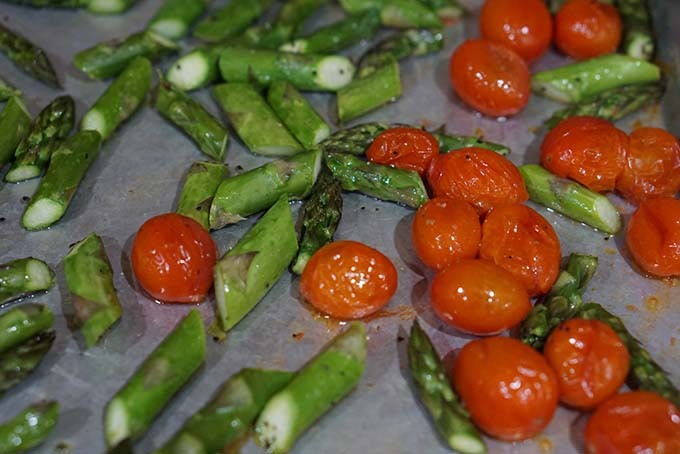 Put the tomatoes and asparagus on a cookie sheet & toss with olive oil, salt & pepper. Into the oven they go for about 15 minutes (stirring once halfway thru) cook them just until the tomatoes begin to burst and the asparagus is still crisp & bright green. Put a large pot on high on the stove to boil the pasta. 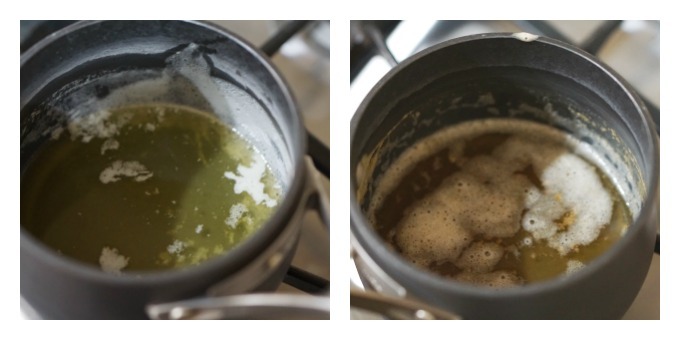 When boiling cook the penne pasta to aldente, drain reserve about a cup of the pasta liquid. Put the butter in a small sauce pan on medium low. Swirl it occasionally. It will take about 5 minutes and the solids will begin to rise to the top of the butter. 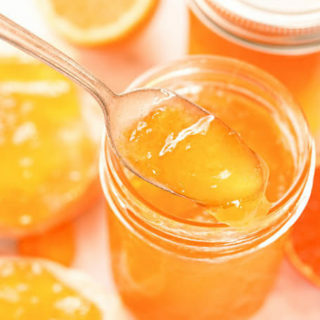 Take a small spoon and skin them off the top. Continue to cook the butter over medium-to medium/low heat. It will become a brown color and the taste will be nutty and have much more flavor. To assemble transfer the pasta back to your large cooking pot. Add the vegetables, brown butter, lemon zest, juice and cheese. Stir to combine. If it is too stiff - add 1/2 cup reserved pasta water and stir again. Add additional pasta water if needed. wow this looks good..would love to try this sometime soon. 🙂 Pasta is my fav! If you do, make sure you drop a line and let me know what you think! Thanks for stopping by! 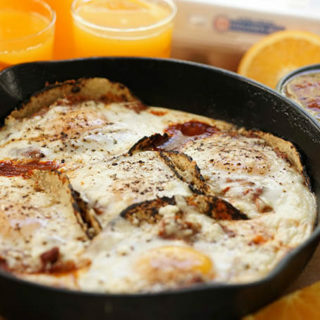 Love this light & easy meal – thanks Cookilicious!! 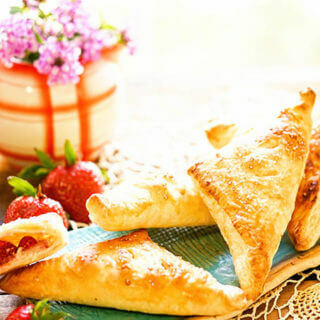 O yum! This sounds like a delicious pasta recipe! You can’t go wrong with pasta and butter, right? Looks delish! Yum, yum, yum – ain’t that the truth! 😉 Thanks for stopping by Danielle! Lentil pasta??? I want to try that!! And roasted asparagus is the best. I ate an entire bunch MYSELF last night! In my defense, they were the very skinny ones, but still….so good! Sounds great! I make a similar dish with asparagus and tomatoes. You just can’t beat fresh veggies! I think so too and that touch of lemon, makes it just right! What a lovely little package to receive! 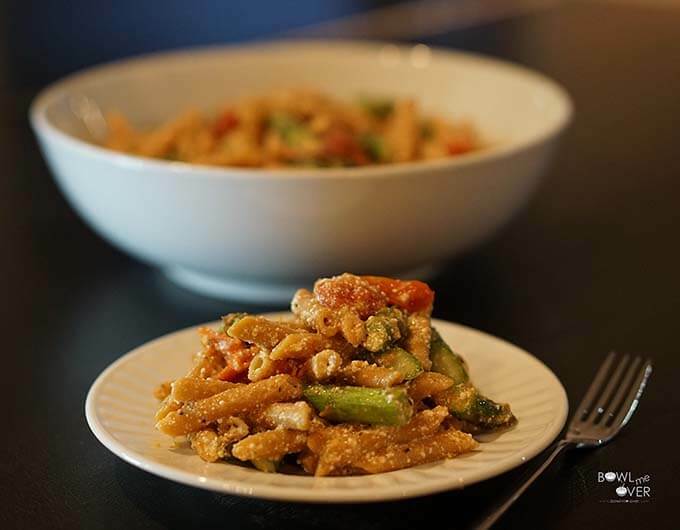 The dish looks great and I love the idea of lentil pasta! It was Mel – what a treat! I hope you do Uma, love to hear what you think! I love pasta! Especially with asparagus and tomatoes! Absolutely – match made in heaven! Looks so good…brown butter is almost ghee, judging by your method of making it..but I have never used ghee to make pasta…wonder why.. Pretty close, yes! I’m sure ghee would work really well. I hope you give it a try, you’ll love that pasta! 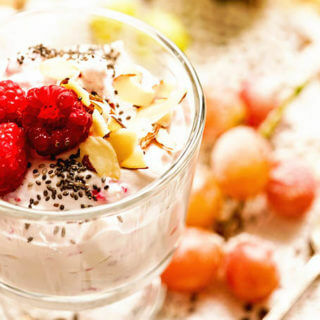 Thanks Vanessa – we just love this meal!! You bet – thanks for stopping by Nancy! 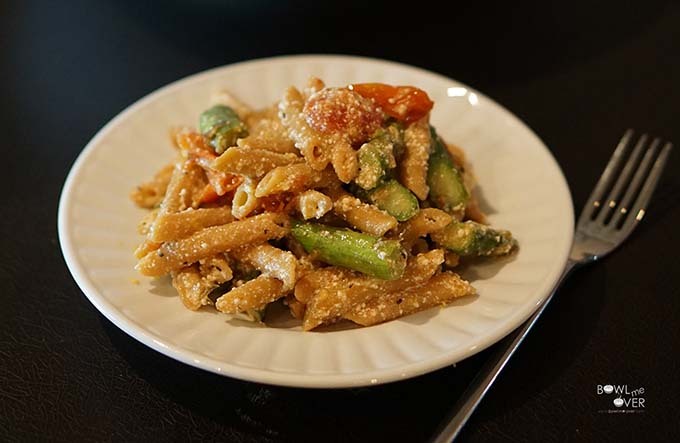 I’ve never tried lentil pasta, but being gluten free, I’m definitely going to look for it. Looks like a great delivery and meal! We really like it Kelly – I made it again today using the Penne in a soup w/lentils to drive that flavor home – super good, I’d really recommend it! I love this creative twist on penne! 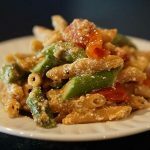 Pasta loaded with veggies is one of my favorite dinners! I love that you used asparagus, such a fun veggie. I agree, love asparagus – so much flavor!!! Oh wow, this sounds delicious! I love a good brown butter sauce, and paired with those veggies would taste amazing! So yummy, I hope you give it a try Donna, thanks for stopping by! I need to be on the lookout for this pasta made with lentils – how great! This dish is beautiful, and couldn’t agree more that lemon adds such a lovely flavor to roasted veggies. 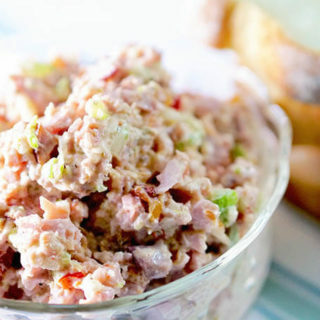 Great dish! Absolutely Patricia – that pasta is so good, I made a soup with it last night and it was just incredible!